We were told about many orphan wild leopardcubs that end up at reserves or other private projects, who handraise them and want to offer them a permanent home as acc. to them they cannot be released again. Sadly they often also offer interaction with these cubs! 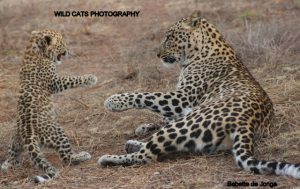 To those we want to offer to bring the cubs (youngsters up til a year) to us as our leopardfemales and also males for sure will adopt them and teach them how tobehave like a leopard again. No more interaction with humans, but humans close enough for them not to get shy, so after some time (approx a year) they are suitable to go to (for sure) a Private Game Reserve. Not tame but also not shy cubs are perfect to live wild but protected and to be sighted on educational game drives, they make the best ambassadors. Even our captive born, but motherraised leopardyoungsters are suitable for this and soon move out. 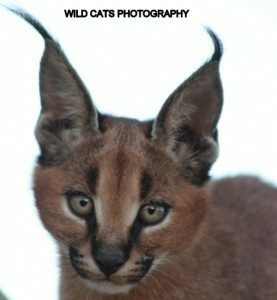 We ask no money for this essential offer to help rehabilitate the cubs or youngsters, only compensation in the care (so best food and medical care). Of course their stay is meant to be temporarily, and we won’t offer a forever home. Our leopards (adults Feline and Felix) did adopt the other two others while still under the age of 1 year, and also adopted each other’s cubs from birth. This excellent opportunity we can only offer with our leopards, and if one is serious about wanting them to act like a leopard and live wild again, they must consider this offer. Of course Nature Conservation must be notified and give approval to this! If interested e-mail to info@wildcatsmagazine.nl for the availability. We don’t take more than 2 cubs/youngsters at a time of course. Spread the word! The focus of our project in South Africa at this moment is our co-operation with three incredible Private Game Reserves (names mentioned at final stage) in the Eastern Cape, to have our leopard youngsters (Solo, Olive and later Bahati & Bella) released. The Reserves are very interested in leopards from our bloodlines and our ultimate mission is to have them released, and live wild and free roaming. Of course as always the only obstruction, or delay, is by applying for the permits, or better: to have the forest dept. grant the permits. While the leopards in certain parts of South Africa, like the Free State, are doing well in some National Parks and Private Game Reserves, the leopardpopulation in the Eastern Cape is almost extinct, and now also confirmed that even the Cape Leopard Population near Cederberg/Capetown, is having far more dramatic numbers than first was claimed. While in the (Eastern) Cape not just the Cape Leopard is roaming freely, of course also the common African Leopard does have a place in this area, like in the whole of Africa, if people let them. Nature Conservation is reluctant to grant permits for a release of common African Leopards in the Eastern Cape, for some not-valid reason, claiming “just” the Cape Leopard is living in this area of South Africa. Of course we, and the managment of the Private game Reserves, don’t take no for an answer, and are working hard behind the scenes to collect info, to hand in motivation letters along with the application for the permits. Maybe a good idea for all to read the following article, confirming how dramatically the numbers have declined in the Cape, and that is almost impossible to collect data, and to sight leopards in this area. Like we are saying all the time: leopard conservation, in-situ and ex-situ, is most essential at this moment. So the person basically saying “NO” to a release in the foremost Private Game Reserves in the Eastern Cape, will in fact be responsible to the leopard getting extinct in this area. Do they want to be responsible for this? “…….the complete absence of leopards is concerning. In total the survey effort was 2 334 days – substantially higher than the average survey effort in KZN of 1 692 days*. While this may not have been a sufficient period to obtain enough leopard pictures to generate a population density estimate, we would have expected to obtain some leopard pictures. Camera trap surveys in the mountainous regions of the Western Cape where leopard densities are similarly low (1 leopard per 100km2) have typically recorded at least 1 photo per 100 days of camera trapping. 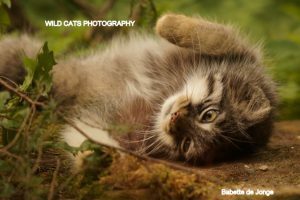 *This is calculated by multiplying the number of camera trap sites / stations by the number of days spent in the field. For example, studies in the Cederberg Mountains and Little Karoo both recorded leopards at a rate of approximately 0.012 leopard captures per day (Martins 2010, Mann 2014). A similar capture rate in the Drakensberg would have yielded around 27 leopard captures during this survey. While this is a coarse measure, it does show that leopard capture rates in the Drakensberg are much lower than have been recorded in other, reasonably analogous areas. While it would be premature to suggest that leopards are absent from the southern Drakensberg, these results confirm a more general trend of extremely low leopard numbers in marginal habitat areas. This is of concern as these areas are generally considered to support extant leopard populations and account for a significant proportion of leopard habitat in South Africa (Swanepoel et al. 2013).